In a tough economy, it becomes more difficult to sneak away from the office, but also less realistic to spend your savings on a big vacation. 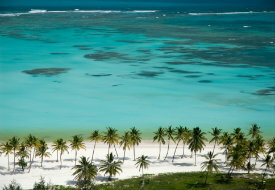 Given the constraints on travelers' time and checkbooks, few options are as ideal as a quick jaunt to the Caribbean – direct flights are readily available from most East Coast airports to most island hubs, and the variety among the islands means there’s a destination for everyone – from the nature enthusiast to the luxury-demanding mogul. Unfortunately, no destination is without at least one drawback, and in the case of the Caribbean, this drawback is hurricane season. Typically running from June 1 to November 30, the Atlantic Hurricane Season has been known to put quite a damper on many vacationers and cruisers on the Caribbean islands. On the other hand, the unpredictability of the hurricane season also means there are great deals on travel to the Caribbean during these months. While there is no guarantee that any destination will be totally safe during the season, the editors at VirtualTourist have put together a list of "5 Caribbean Islands less likely impacted during Hurricane Season." While still a part of the "ABC islands," Aruba claimed its autonomy from the Netherland Antilles in 1986, and now is a separate entity within the Netherlands. The furthest westward of the Lesser Antilles, Aruba is probably your safest bet for a hurricane-free vacation, as it’s truly out of the path and hasn’t been hit since Hurricane Felix in 2007, which was only a Level 2 hurricane. The capital city of Oranjestad has the tall multicolored houses similarly found in other Netherland Antilles, but there are also some treats not found on the other islands: The Antilla, a German freighter, the Caribbean's largest wreck at almost 400 feet long, is a prime dive spot off Aruba. 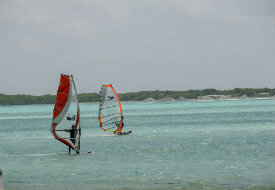 Among the islands other water activities, deep sea fishing, parasailing, wind and kite surfing are all especially popular. Bonaire could be described as the "St. John" of the Netherland Antilles: the first Netherlands Antilles Island to establish a natural park, the island places conservation and sustainable tourism at the forefront of its present and future. 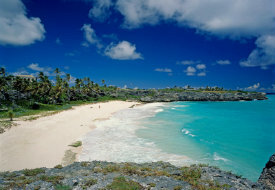 Located 38 miles east of Curacao, the island is twenty-four miles long with a total land area of 112 square miles. Washington-Slagbaai National Park encompasses over 13,500 acres of that land, covering the northwest corner of the island. The island has been renowned for its snorkeling and diving opportunities and conservation; in 2008, the National Oceanic and Atmospheric Administration (NOAA) designated Bonaire as having the healthiest reefs in the Caribbean. 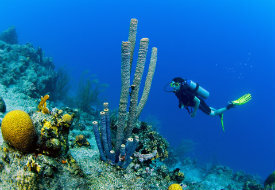 In addition to the national park in the island’s northwest corner, all of the waters surrounding Bonaire were designated a Marine Park in 1979. Though Curaçao did have a run-in with Hurricane Felix in 2007, the "C" of the "ABC Islands" is still a great bet for a safe and drama-free trip during hurricane season. Curacao is the largest of the Netherland Antilles, located in between Aruba and Bonaire, just 35 miles north of Venezuela. In addition to having over 35 beaches, the island has lots of opportunities for the active traveler. The island boasts 60 spectacular dive locations, including the Tugboat site, a wreck that sunk over 25 years ago, and Klein Curacao, an uninhabited desert island off the southeast coast of the main island. For those who want to stay on dry land, hikers can venture to the island’s highest point, 1,230-foot Mount Christoffel, which lies in a reserved wildlife park. The island’s main city, Willemstad, is filled with unparalleled color and preserved Dutch colonial buildings; the town itself is a UNESCO World Heritage Site. And don’t forget to taste one of the island’s famous exports: blue Curacao, the liqueur, which is made from the rinds of island grown Laraha oranges, and actually comes in several bright colors. Related: Which Curacao Neighborhood Is for You? Though we associate Barbados as a British settlement, the island was actually originally given its name by Portuguese sailors and originally settled by Amerindians from Venezuela. The combination of British, African, and West Indian influence has contributed to Barbados’ unique culture, seen in everything from Bajan music to cuisine. While many people know Barbados for its most recent export, Rihanna, the island’s most influential export has to be rum, and the island is quite proud of this, hosting over 1,500 rum shops in its 166 square miles. When you’re not jamming out or drinking, there are also 70 miles of beaches to cover: while the west coast offers calm waters and dusty white beaches, the eastern shoreline has waves for surfing and the south has reef-protected waters perfect for snorkeling or swimming. Another unique opportunity in Barbados is to swim with Hawksbill and Leatherback turtles, which flourish in the oceans surrounding the island. The eastern and southern shorelines, with their rocky coasts and reefs, further protect the island from hurricanes, making it another relatively “safe bet” for the season. Sharing half of an island with French-colonized Haiti, the Dominican Republic was colonized by the Spanish, and though its origins permeate the culture, the nation has also grown into an identity all its own. Known around the world for its gorgeous beaches, colonial capital, and home-grown baseball stars, the Dominican Republic is also well-positioned for hurricane season. The resort area of Punta Cana is an especially safe area, naturally protected by nearby Puerto Rico and the Mona Channel, whose different temperatures and conditions in most cases pressure tropical storm and hurricane formations to make their turn north to Samana or south to the Caribbean Sea. On the other side of the island, Puerto Plata is also known for being infrequently hit by hurricanes. Once you’ve gotten to the island, the variety of activities is endless. Santo Domingo, America’s first city, is an UNESCO World Heritage site. Partake in some Dominican specialties, such as rum, chocolate, coffee, merengue, amber, and larimar while strolling the colonial city. Another unique aspect to the Dominican Republic is its kitesurfing culture. Cabarete Beach, located on the island’s North Coast, has been repeatedly named one of the top five kiteboarding and windsurfing beaches in the world, hosting a number of international championships. VirtualTourist is a worldwide travel community where real travelers and locals share real travel advice and experiences.